Describe it as you will, but conflict of some strip is at the very heart of storytelling as we know and understand it today. Yet, paradoxically, to create truly good--much less consistently great--comics, there must be some kind of artistic harmony between all the members of a creative team. And, as anyone who's done it will tell you, there's a real art to collaboration. Just as blues musicians will use counterpoint, dissonance, call and response, and other aural acrobatics to enliven their performances, building their own special language together, so, too, do the very best comic book collaborators work separately to together create something very rarified and special, indeed. 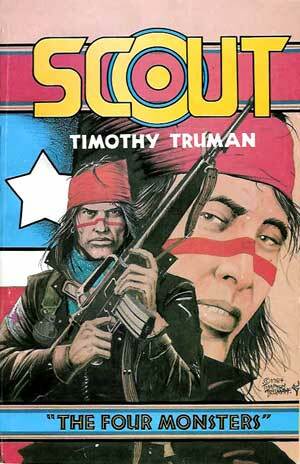 So what's all this got to do with Timothy Truman, much less his creator-owned series, Scout? Timothy Truman: Well, Dynamic Forces and others had been after me to do a Scout reprint collection for ages. I'd always resisted it, because while I'm proud of the work I did, I hate to look at my old artwork! I've gotten a lot better at drawing over the last few years and I really hate to look at the book. However, Dynamic seemed to have a great marketing plan going, and at the same time that Nick approached me there were plans to do the GrimJack reprint books with IDW. So it seemed like a god thing to put my ego in my pocket and get things started. Dynamic Forces has been fantastic to work with. BB: Any chance that you'll be doing new stories featuring Scout? TT: I'd love to do new Scout stories, but really have to devote my energies to the new GrimJack material for the next few months. After that, we'll see. It would be fantastic. BB: I strongly suspect that we're all in agreement with you, there. Which leads me to wonder, if you returned to Scout after all these years, how your approach to storytelling might have changed between then and now? TT: It's hard to say. Scout was an adventure story, but it tended to get more cerebral in tone at times. 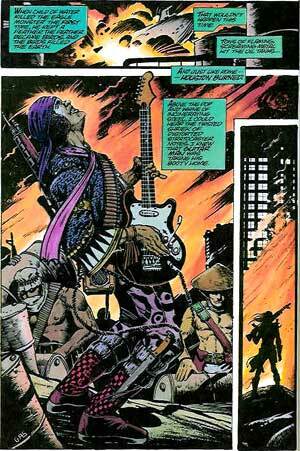 Visually, it was more Sergio Leone- or Akira Kurosawa-inspired than GrimJack. It had an interesting dynamic--slow, steady shots for setups, then a quicker pace for action scenes. It's how the camera in my head works when left to its own devices. Scout took place mainly in the desert, and evoking that environment also has a lot to do with the storytelling. It has to have a different pacing. Like a rattlesnake in the desert sun--laying on a rock looking deadly but slow while it's resting, then suddenly springing when there's prey nearby. Does that make sense? BB: Yes, it sure does. TT: GrimJack is city shots--film noire, with monsters, demons and swords. The environment demands that the story be told in a different fashion. BB: Do you still basically create the stories and art the same way? Do you think it would essentially "feel", look and read the same way? TT: Yes and no. For one thing, it would look better! My art has gotten so much better over the last five years or so. I take a lot more care with things. When I started doing Scout in the 80's, I'd just gotten off doing GrimJack at an incredible quick pace, penciling and inking. Then I jumped into Scout, doing 20 pages of story, pencils and inks a month. The book always shipped on time. That went on for several years. It's an unimaginable workload, and it set up some very bad drawing habits that took me years to break. A few years ago I took a break from comics and started doing a lot of single illustration work for book publishers and game companies, as well as design work for some computer game companies. It forced me to slow down and re-develop my drawing skills. I was able to remember what I wanted to do and where I wanted to go when I first started freelancing in 1981. Also, I started teaching at Pennsylvania College of Art and Design--a wonderful little illustration school here in Lancaster, Pennsylvania. Being around the students and around professional illustrators from other genres was a wonderful thing. There were fresh outlooks available to me for the first time in years. I went through a period where I totally re-evaluated my work, and it paid off in big ways. At least I'm more satisfied with the stuff. My work now is more along the directions that I'd wanted to take it in 1981. As far as storytelling goes, I'd pace it a lot differently. That "rattlesnake" thing would still be there, but if I'd do a new Scout series I think I'd do a lot more experimentation with pacing. Also, I'd make the line-work simpler and more graphic looking. Visually, it would either be more "cartoony" or animated looking--or it would be totally the opposite--realistically depicted with every panel photo-referenced like a "professional" illustration, or like you were watching stills from a film! I've considered both techniques, and either one has its advantages. We'll have to see, if I ever get a chance to launch the Scout: Marauder storyline. First thing's first, though. Have to finish this GrimJack run. BB: Do you think Scout is something you could just naturally "fall back into", so to speak, or would it take a bit to work yourself back into that world and character before it felt natural? TT: You have to understand that the Scout storyline was totally a product of his era. Scout came out of what I saw going down in the Reagan and Daddy Bush eras. It was a direct reflection of that. I am an unrepentant and unreconstructed leftist and remain so to this day. But I'm a "Dixie leftist", which make my opinions more in line with, say, the Wobblies or the Populists of the old days, I guess. Anyway, the world has changed so much. Industrialism is an exalted institution now. There's this scary fascist theocracy thing happening that resembles something we'd have read in a 1950's science fiction novel--actually, the regime reminds me not a little of the government that my friend George R. R. Martin described more recently in the short story "And Seven Times Never Kill A Man" (found in Nightflyers). Whatever the case, it now seems to be happening in real life. Let's just say that there certainly is a lot of fodder for me to be inspired by. BB: I know you're a huge music fan as well as a fine musician in your own right, and your clear affection for the blues is shown in Scout's chapter headings. So, aside from such obvious outcroppings, how does music directly and indirectly affect, feed, inspire and influence you as a comics creator? Is it just there, playing in the background while you work, or does that music sometimes find expression on the page in other, less obvious ways, finding or even creating something akin to rhythm, call and response and other musical effects through the use of different comic book narrative structures and techniques? TT: Music has had an enormous impact on my visual style, as well as my writing. Panel-to-panel storytelling-wise, I find that my stories work best when there's a sense of musical dynamic to them-- a conscious sense of tempo changes, swells, and crescendos--even bridges between chorus and verses. It's unavoidable to me. I really compose a story along many of the same themes that happen when I'm putting together a recording in my studio. Even working with another creator, as I've done with writers like John Ostrander and Joe R. Lansdale, I find things coming into play that are very similar to things that happen when I'm jamming with other musicians in the studio or on stage. You nailed it with the mention of "call and response." When you're playing music with a group of people you have to listen to what they're doing and respond to it. You also have to know when to step aside and let them have their turn in the song. You can't "showboat" by playing a guitar solo though the whole thing. You have to know when to add your own flash and when to play a supporting role. So with a comic story, I just try to add to the mix and make the group sound like a band--to carry this groaning little metaphor even further. [Laughter] We establish a melody. We stick to it. We stray from it when it seems dynamically appropriate. I step out and add a few hopefully well-placed leads; comics-wise, Mike Gold calls them my "eye ball kicks". We bring the whole thing to a climax and hopefully leave the reader wanting to hear the next song. Something that I learned when trying to explain me to my students my storytelling approach is that I like to play with opposites. For instance, when I'm working with Ostrander on GrimJack, I find that John comes at a story with a sense of spiritual morality. So my first response is to offset that with a kind of darkness. I gleefully stab at the seedy underbelly of things. By the same token, when I work with Joe, I find myself taking the opposite approach. Joe and I can both be very dark in our natural approach to storytelling--we're really similar when it comes to that direction. 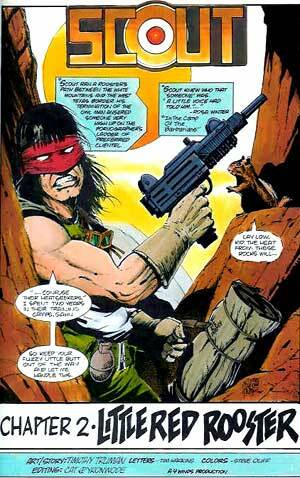 But if I did "GrimJack Dark" on top of "Lansdale Dark" it would be, like, way too dark. The overall story dynamic would be somehow lessened. So I find myself being a sort of moral compass. It usually works really well. When I'm doing something totally on my own, as I did with Scout, I find that I'll play opposites between the, say, the dialogue and the visuals. Something with "light" going on in one while something "dark" is being depicted or described with the other. For me, it makes for a really cool storytelling dynamic. Symbolism, irony, and themes for the stories come out of it. It's also a great method for problem solving in a story or a drawing. When my students run into a wall when they're doing conceptual work on a project that I give out, I tell them to think of all the opposite things that the information in the assignment is telling them to do. Usually, the approach gets them over the hill and gets them thinking "into" the assignment in a deeper way. And, as far as music feeding and inspiring me, it always has. Everyone has been aware of this rock and roll attitude in the stuff I do. It's always been there. When I worked at TSR Hobbies/Dungeons & Dragons before I even got into comics, I'd be with the other TSR artists at Gen Con and they'd be approached either by these well-dressed, really yuppie-looking suburban lawyer types of fans or the stereotypical, rather nerdy looking game fan kids. The fans who would beeline to my section of the table would be the punks and rednecks and rock kids with ripped jeans and tattoos and Mohawks and leather jackets. And at Gem or at subsequent comic cons, anyone in the room who owned a Harley-Davidson--and believe me, there are more out there than one would guess!--would come to the con with the mission of seeking me out. It hardly ever failed. So I've been aware of it for a long time. Then, when you get called into rock projects and find out that guys like Carlos Santana and Jerry Garcia are very aware of your work and have, in fact, sought out your comics, it sort of bring things full circle. Anyway, back to inspirations: A lot of bands inspired me as an artist and writer, but the foremost of them would have to be Jefferson Airplane-- particularly the lyrics of Paul Kantner and Grace Slick. Lyrics like, "From here to heaven is a scar, deep as death," just about all of the other tunes from the Crown of Creation album, Sunfighter, or Blows Against the Empire hit me hard. The songs from the Bark and Long John Silver LPs are even more steeped in fantastic imagery. Seeing images from those albums as I listened to them worked their way into my art. And the inventive poetry had an effect on the way I write stories. We're talking huge impact, here--the genesis of my entire approach to creating things. Blues music became a sort of soundtrack to a lot of the stuff I did, especially Scout. When I draw and write stories, I'm actually sort of directing a film on paper. So I listen to music that I'd like to hear in the film. Scout was all about the blues and slide guitars. Muddy Waters, Willie Dixon and especially Howlin' Wolf. Son House. Bukka White. Black Ace. That sort of stuff. If there was a Scout movie, the music would be by Ry Cooder and Carlos Santana sitting in with the North Mississippi All Stars. I hear a lot of Jimi Hendrix in Scout, too--the Band of Gypsies stuff. Another rock-related factor that had a huge impact on me--especially for GrimJack--is the comedy group Firesign Theater. They set up some futuristic society concepts in some of their albums that is pure Cynosure. BB: One thing that's always struck me about your run on Scout was the strong distinction made between what makes one person a "soldier" and another a "warrior". What are the real differences between these two ideas, and what bearing, if any, might that idea have on your own self-image as an artist and creator? TT: Well, I've never been much of a soldier. I'm a wild card. I like to do my own thing and take it my own way. I try to be professional in all regards on any project, but I admit that I can get very testy and hard to deal with when I feel that someone is imposing themselves upon what I'm trying to do and that they just don't "get" it. Luckily, that's not happened very often, and it's why I work so well with guys like Ostrander and Lansdale. I love their approaches and totally respect their work and try to be there for them to support what they're trying to do with the work. By the same token they realize that I'm very individualistic and have my own outlook on things, and they let me go for it. Creatively, I like to work with a team, but it has to be a team of guerilla warriors. I do not play well with the infantry. BB: Tim, I know for a fact that GrimJack was and is still very important to you in a number of ways. How about Scout? What did this book do for you when it first came out--as an artist and storyteller, and as a professional--and what new things do you hope that it might be able to do for you today? 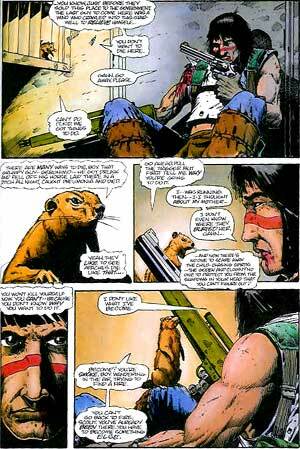 Scout was and is important to me because it was my first chance to be totally me as both writer and artist. It was my unique personal vision to both writing and drawing comics. It had a huge impact on the field that I'm quite proud of, and the fact that it reached outside the field--to rock and roll musicians I admire, to Indians/Native Americans who appreciated the sentiments of the book--is a major added plus. BB: Well, what do you get from doing comics, in general? TT: I can't not do them. It's just the way my brain is set up. I love doing single illustration work just as much, and I love doing music just as much, if not more--but doing comics is a big, enjoyable but frustrating challenge that I just have to do. When I don't do comics, I miss it. BB: What do you hope readers, new and old, get from Scout? TT: 1) Be a warrior, not a soldier. 2) Don't accept the world at face value. BB: How about from you work, in general? BB: Anything else to add before I let you get back to work? TT: New websites: www.GrimJack.com is still in development but doing nicely. And I have a little side-pocket there, www.TTruman.com, as well as my "booth" at comicon.com, www.TimothyTruman.com.